We Offer Innovative Precision Rotary Broach Tools Delivered Fast! We Manufacture Rotary Broaches for the Medical, Aerospace, Automotive, Plumbing and Fastener Industries around the World. 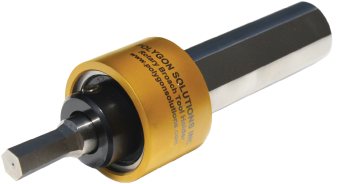 Why Choose Polygon Solutions as your Rotary Broach Tool Manufacturer? Polygon Solutions specializes in rotary broaches also known as wobble broach tools for CNC lathes, mills and screw machines. Our continuous effort is to develop cutting edge products and technical support for our customers. Your technical support issues will be addressed by actual machinists and engineers, not salespeople! Our commitment to quality comes first in everything we do, from standard hexagon broach tools to the latest in broach holder technology. No matter what industry you work in, from medical devices to aerospace fasteners, we are dedicated to being the best solution when looking for rotary broaching tools. Polygon Solutions aims to be a superior manufacturer of broach tools. We will continually improve our quality management system so as to create customer satisfaction by exceeding our customers’ expectations through the delivery of superior machine tools and services in a safe and environmentally responsible manner. Our product line includes hex, square, 6-lobe or torx-style, double hex, serration, involute, spline, spur gear, J500 and micro rotary broaches. Many other polygon shapes can be manufactured per your specification. Our precision rotary broach tools are made from hardened M-2 High Speed Steel but may also be order with PM M-4, M-42 and PM T-15 High Speed Steel. Coatings such as TiN, TiAN & TiCN are also available on any of our cutting tools. To request a quote on a special form rotary broach tool please fill out our Request Quote Form. Click here to view an online Catalog of cutting tools and tool holders manufactured by Polygon Solutions, Inc. If you are new to rotary broaching please read our article How Rotary Broaching Works? If you have any question about the rotary broaching process and how it may be applied as a solution to your manufacturing needs please call our engineers at 239-628-4800. Rotary Broaching is a precision method for producing internal polygon forms at an extremely fast rate. The entire operation can be completed within seconds and can produce forms to 0.0005″ accuracy or better. Common forms include hex, square, torx-style, serrations, rosan, splines, j500, involute splines, double hex, double square, double d, rectangle, triangle, and keyways. Polygon Solutions’ innovative and award winning Rotary Broaching Tools are used by a variety of precision machining companies. Because our rotary broach holder will work on virtually any lathe, mill, or turning machine, a large number of applications can be improved by eliminating secondary operations and creating broached forms. The Medical, Aerospace, Automotive, Plumbing and Fastener industries benefit significantly from the use of rotary broaching tools. 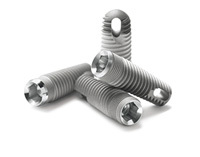 Rotary broaching has numerous uses in the Medical Industry including bone screw and implant applications with hexagon, Torx® style, six-lobe or hexalobular drive features. Due to the demanding nature of the medical field for reliability in surgical procedures, machining standards for surgical equipment tend to be very precise compared to other similar size and material metal parts. Rotary broaching uses the full force of standard turning machines to create polygon shaped holes. These holes are manufactured in precision machined metal products. 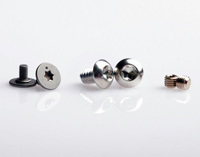 The aerospace industry has unique needs for customized, lightweight, precise and high-strength fastener products. This need makes this tool an excellent addition to any aerospace machining facility. Rotary broaches are available with standard hexagon, square and custom made shapes. The main advantage of a rotary broaching operation is that processes can be completed on the machine where the part is first turned or milled. This eliminates subsequent operations and results in savings of time and money. Automotive suppliers intent on reducing costs due to fierce competition may reverse engineer some part features to take advantage of this machining technique. Most fasteners are screws, nails, staples and other retaining devices used to hold mechanical pieces or materials together. Most are mass produced in very high volume processes requiring little customizing or precision. The need for precision fasteners does exist however, and these are the parts that can benefit from rotary broaching tools. Polygon Solutions offers the largest selection of special forms to suit a variety of applications. Call and speak to one of our Engineers today about your specifications - 239-628-4800. All of our special forms are made in-house, which allows us to provide extremely fast delivery times.